Thanks for stopping by my site! 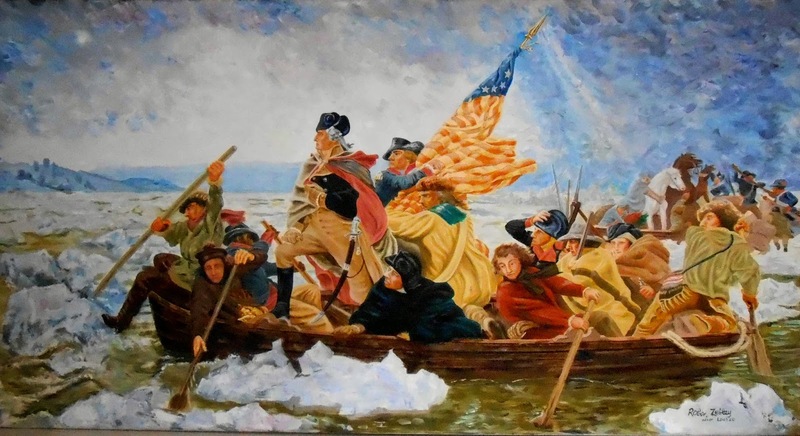 I usually paint house and pet portraits, but I had a request to paint a copy of this iconic American history painting, Emmanuel Leutze's Washington Crossing the Delaware with personalized details, sofa sized, which leads me to offer any subject from photos, any size! My client found my house portrait paintings and asked if I could copy this favorite of hers, but paint it a bit looser, a bit more "impressionistic" and incorporate the colors of her home. So I stretched my wings, and off I went! I loved painting it! I've been wanting to do larger paintings, and this was a perfect one to start with. I am thinking how cool a "sofa size" original painting would be as a wedding gift! I am going to paint some house portraits that include the front garden, florals (perhaps a selection of flowers from a wedding bouquet, pet portraits that include their yards or outdoors along the beach, landscape paintings of favorite vacation or honeymoon spots, well, I'm just going to get painting big!